Findzall Community Marketing supports economic development professionals, chambers of commerce and neighborhood organizations with business marketing, retention and attraction strategies using advanced internet technologies and expert retail consultation making your community a competitive and preferred shopping, dining and events destination. 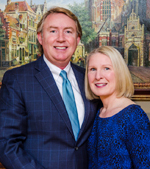 Findzall was created by Cathy and Mark Maloney to provide an educational resource for local business owners and their community leaders. Findzall is distinctly different from the traditional marketing agency. We exist for the sole purpose of supporting community economic development while traditional firms are focused on the individual business needs that center around the "4 P's" of marketing (Product, Price, Place and Promotion). In community marketing the price and place is fixed and beyond the control of the economic development leadership. We concentrate our expertise on the product, the neighborhood as a whole, and create innovative promotional strategies designed exclusively for communities. Findzall provides a wealth of resources and methods designed to create a community that effectively attracts businesses and shoppers. Findzall founder Cathy Maloney's work in Elmhurst was highlighted in Retail 1-2-3, a planning guide for community leaders produced by Campaign for Sensible Growth along with the International Council of Shopping Centers (ICSC) and the Metropolitan Planning Council. Cathy has been asked to be a panel member, speaker and roundtable discussion leader in many ICSC and community forums. Cathy's clients have included the City of Elmhurst, the Village of Tinley Park, the Village of Glen Ellyn, the City of Wheaton, the Village of Mount Prospect, the Village of Oak Park/Downtown Oak Park, Morton Grove, Berwyn, Six Corners/Portage Park and other consulting projects with The Goodman Williams Group. Findzall Community Marketing, formed in 2009, provided a Marketing and Communications Strategies for the Village of Tinley Park and Clark Street in Lincoln Park as well as the marketing strategies for the 159th Street Corridor Plan in the South Suburbs. Cathy is a member of the International Council of Shopping Centers. Findzall brings together Cathy Maloney's more than 14 years of economic development consulting and Mark Maloney's more than 20 years of business development and project management experience. Together they formed Findzall and selected strategic partners that are leading experts in the field of community marketing and consulting. eMarketing Logic is a strategic partner that provides email marketing, web design and marketing services that connects local businesses to a combined customer list. Findzall also works with the Goodman Williams Group that specializes in market and financial analysis of redeveloping neighborhoods and downtowns. While we have relationships with a vast array of marketing experts, we make every effort to first utilize the local talent found within the communities that we serve. Cathy and Mark Maloney have a millennial son Christopher Juby, a Public Relations executive, now living in Brooklyn, New York. They reside in Elmhurst, IL with their golden retriever Chloe. Connect with Cathy Maloney on LinkedIn.